The SICE Annual Conference offers two tutorial lectures in the afternoon of Saturday 14th September. 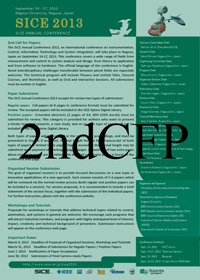 All participants for SICE 2013 are invited to attend them. Tutorials are free of charge! Title: How to get inspiration and imitate mother nature in Robotic design? Abstract: Mother nature is precious source of imagination in the design of brand new robotic systems, but passive atittude to get inspiration from the nature and/or to mimicry the motion of the animals would never be effective to create unconventional and useful Robotic systems. I will discuss the needed attitude which we have to have when we are going to proceed this interesting approach toward Robotics by referring to my own experiences to design snake-like mobile robots, snake-like manipulators, snake-like grippers and spider like walking robots. 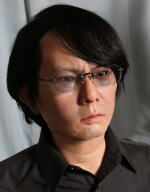 HiBot Corp.(Director), Tokyo Institute of Technology (Professor Emeritus) Short Bio. : Shigeo Hirose is a Director of HiBot Corp. and Professor Emeritus of Tokyo Institute of Technology. He received Dr. E. degree in 1976 in Control Engineering from Tokyo Institute of Technology. His research interest is in the creative design of robotic mechanisms and their control. He was awarded more than 70 academic awards, including Joseph Engelberger Robotics (2009), Carlos Ghosn Award (2008), Medalwith Purple Ribbon from Japanese government (2006), Award of Merits from IFToMM (2004), the first Pioneer in Robotics & Automation Award (1999). He is a Fellow of IEEE, JSME and RSJ. Abstract: Studies on interactive robots and androids are not just in robotics but they are also closely coupled in cognitive science and neuroscience. It is a research area for investigating fundamental issues of interface and media technology. This talks introduce the series of androids developed in both Osaka University and ATR and propose a new information medium realized based on the studies. Osaka University and ATR Short Bio. : Hiroshi Ishiguro received a D. Eng. in systems engineering from the Osaka University, Japan in 1991. He is currently Professor of Department of Systems Innovation in the Graduate School of Engineering Science at Osaka University (2009-). He is also group leader (2011-) of Hiroshi Ishiguro Laboratory at the Advanced Telecommunications Research Institute and the ATR fellow. His research interests include sensor networks, interactive robotics, and android science. Abstract: Soft robotics is an emerging field of research that uses soft or compliant materials and elements to overcome the limitation of traditional robotics. Traditionally, robots have been used in an industrial environment with few unknown parameters. As more and more robots are used to interact with environments that are uncertain and vulnerable to change, a technology that can easily adapt to the changing environment is needed. Soft robotics deals with this issue by using soft and compliant elements in an intelligent way.Bio-inspired robotics is the field of robotics that leads the use of this technology. Nature has many examples where it achieves high performance with a soft intelligent design. Flytrap, for example, can close its leaves quickly by using bistability of the leaves and inchworm achieves adaptive gripping with its prolegs by using the buckling effect. These examples show that high performance can be achieved with a simple and minimum design. In this talk, I will give an overview of various soft bio-inspired robotic technologies and some of the robots that are being developed at SNU Biorobotics Laboratory. These soft robotic technologies will be helpful for robots that need to perform in rough or uncertain environments with a limited size, such as military robots and biomedical robots. Biorobotics Laboratory, School of Mechanical and Aerospace Engineering Seoul National Univeristy, Seoul, Korea Short Bio. : Kyu-Jin Cho (M`08) received B.S and M.S. 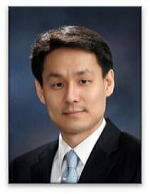 degrees from Seoul National University, Seoul, Korea in 1998 and 2000, respectively, and a Ph.D. degree in mechanical engineering from Massachusetts Institute of Technology in 2007. He was a post-doctoral fellow at Harvard Microrobotics Laboratory until 2008. 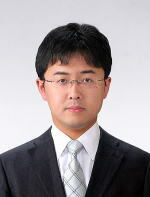 At present, he is an associate professor of Mechanical and Aerospace Engineering and the director of Biorobotics Laboratory at Seoul National University. His research interests include biologically inspired robotics, robotics systems using smart actuators, novel mechanisms using smart structures, and rehabilitation and assistive robotics. Title: How to Make Home Smart in Energy Saving ? Abstract: For a context-aware energy saving system, human activity is among the critical information since knowing what activities are undertaken is important for judging if energy is reasonably spent. In order to make the best of context-awareness especially in a multiple-user environment to assist the energy saving system, this tutorial will explain how Energy-Responsive Aggregate Context (ERAC) can model multi-resident activities and their associated energy consumption. Then, based on the relationship, implicit or explicit, between a given appliance and its associated context, an energy saving system is thus established to determine which appliances are the main sources that cause power waste and how their states should be adjusted so that total power consumption will be saved. To demonstrate the effectiveness of the proposed approach, some experimental results have also been reported. Intel-NTU Center and National Taiwan University Short Bio. : Li-Chen Fu received the B.S. degree from National Taiwan University in 1981, and the M.S. and Ph.D. degrees from the University of California, Berkeley, in 1985 and 1987, respectively. Since 1987 till now, he has been on the faculty and currently is a professor of both Department of Electrical Engineering and Department of Computer Science & Information Engineering of National Taiwan University. He has also served as the Secretary General of National Taiwan University from 2005 to 2008, and in 2007 was awarded Lifetime Distinguished Professorship from his university and Irving T. Ho Chair Professorship from Irving T. Ho Foundation, respectively. His areas of research interest include Robotics, Smart Home, Visual Detection and Tracking, Control Theory & Applications, and Human Computer Interaction. Dr. Fu has been extremely active and highly regarded in his technical field. He has served as Associate Editor of the prestigious control journal, called Automatica from 1996 to 1999. Starting from 1999, he started a new international control journal, called Asian Journal of Control, and became an Editor-in-Chief of the journal till now. 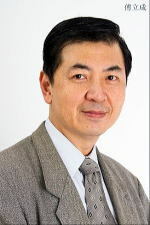 Due to his profound academic reputation, he was appointed as Vice-President for Publication of Asian Control Association (ACA) since 2006, and has been elected as President of ACA since 2012. Dr. Fu has received numerous recognitions for his outstanding performance in research and education during his about twenty year technical career. Domestically, he has received Outstanding Research Award during 1990-1993 and Distinguished Research Awards at the years of 1995, 1998, and 2000 from National Science Council, respectively, Outstanding Youth Medal in 1991, Outstanding Engineering Professor Award in 1995 from Chinese Institute of Engineers, Best Teaching Award in 1994 from Ministry of Education, Ten Outstanding Young Persons Award in 1999, Outstanding Control Engineering Award from Chinese Automatic Control Society (CACS) in 2000, Lee Kuo-Ding Medal from Chinese Institute of Information and Computing Machinery in 2000, Industry-Academia Collaboration Award from Ministry of Education in 2004, TECO Technology Award in 2005, and Distinguished Research Fellowship from National Science Council during 2001-2007, and University Level Industry Economic Contribution Award from Ministry of Economic Affairs in 2010, and Outstanding Research Award from Pan Wen Yuan Foundation, 2012. Internationally, he has been awarded IEEE Fellow since 2004, and has been elected to be a Distinguished Lecturer for IEEE Robotics and Automation Society during 2004-2005 and 2007, and a Distinguished Lecturer for IEEE Control Systems Society from 2013~2015. Abstract: The contribution of electrical power systems to global climate change has become one of the more urgent problems facing the world; accordingly, a high amount of distributed generation capacity, including photovoltaic, wind power, biomass, and co-generated power, is being planned for installation into large-scale power network systems in order to reduce greenhouse gas emissions and fossil fuel reliance. However, it is well understood that many renewable resources pose risks to power system stability in terms of adverse effects on frequency and the creation of voltage fluctuations; hence, in embedding renewables into a grid, it is necessary to create an explicit plan for plant cooperation and generation optimization in order to ensure safety. This talk deals with a game theoretic optimal real-time pricing method based on dual decomposition and its application to load frequency control of electrical power networks. The goal of this optimal real-time pricing methodology is to solve the constrained optimization problem consist of each players' utility and social welfare under selfish players. We can show that selfish players' decision can be expressed via a kind of a Nash equilibrium solution considering their own cost functions and it can lead selfish players' decision to social welfare maximization via real-time pricing method. Finally the proposed method is applied to a load frequency control problem of power networks and the effectiveness can be shown via some numerical simulations. Keio University Short Bio. : Toru Namerikawa received the B.E., M.E and Ph. D of Engineering degrees in Electrical and Computer Engineering from Kanazawa University, Japan, in 1991, 1993 and 1997, respectively. 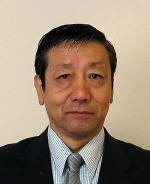 He is currently an Associate Professor at Department of System Design Engineering, Keio University, Yokohama, Japan. He held visiting positions at Swiss Federal Institute of Technology in Zurich in 1998, University of California, Santa Barbara in 2001, University of Stuttgart in 2008 and Lund University in 2010. His main research interests are robust control, distributed and cooperative control and their application to power network systems. Department of Electrical Engineering, Kyoto University Short Bio. : He received his bachelor, master, and Ph.D. degrees, all in engineering from Kyoto University, Kyoto, Japan, in 2000, 2002, and 2005, respectively. In 2005, he joined the Department of Electrical Engineering at Kyoto University, where he is currently a Lecturer. In 2008-2010, he was a Visiting Researcher at the Department of Mechanical Engineering, University of California, Santa Barbara, United States under JSPS Postdoctoral Fellowship for Research Abroad. 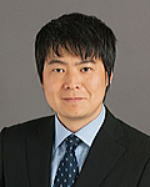 He received the 2009 ISCIE Best Paper Award and the 2012 NF Foundation R&D Encouragement Award. His research interests are in nonlinear dynamics, power and energy technology, and control applications. He is a member of SICE, ISCIE, IEEE, SIAM, and so on.